The B18 HANGAR is comprised of the POCKET CAP FRONT, CENTER SECTION 5, CENTER SECTION 11, CENTER SECTION 2, FLAT CAP REAR, SIDE POCKET ALPHA (Large Radio/Water Bottle Pocket), SIDE POCKET BRAVO (Small Radio Pocket), SIDE POCKET CHARLIE (Pen Pocket), and SIDE POCKET DELTA (Double Pocket). It also includes the MH and SS. It does NOT include a SLIM HANDLE KIT. If you ever think you’d like to remove the all of the Center Sections and zip just the two End Caps together to make the B0 SLIM, you’ll need to make sure you also order an SLIM HANDLE KIT. Storage on the B18 starts with the POCKET CAP FRONT: The POCKET CAP FRONT acts like the “hub” for your entire FLEX System. 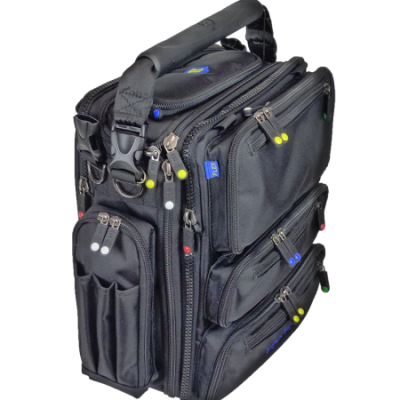 No matter which configuration you carry you’ll be attaching the POCKET CAP FRONT to one end of your bag. And it’s the “hub” because it holds all the important small stuff and tech stuff and personal stuff that you want with you no matter what. If you change configurations, you’ll always move the POCKET CAP FRONT to the new configuration which means you’ll always have all this key stuff with you, without any repacking or reloading. CS5: Next, comes the CS5 (5-inch Center Section), which will commonly be used to hold anything from a bunch of flight documents, to a couple of changes of clothes, to your lunch. The CS4 also comes with a divider shelf which serves to separate the compartment if necessary, which really comes in handy if you want to carry two more full-sized headsets. You can instead fit 13” laptops and a small collection of documents. Many, but not all, 14″ laptops will also fit. – But no 15″ laptops will fit. The CS5 has a really versatile dual-access feature. First, you get full top-access. You can unzip just the top of the bag to give access to your stuff right through the top of the bag. And then when you need, everything can also be accessed by unzipping the entire front panel all the way down to the bottom, giving access to the entire gray interior of the CS5. The Main Compartment of the CS5 DOES NOT YET HAVE locking zipper sliders. It will soon. On top of the bag is a pocket for sunglasses. The other key thing about the CS5 is that it has two FLEX-Mount Side Pocket stations, one on each side, for attaching the two included side pockets. You can, of course, also trade out the side pockets any time you like later on. The CENTER SECTION 11 offers a full 11 inches of interior storage and swallows up multiple day’s worth of clothes. In addition to clothes, the CS11 will carry a small cooler or helmet. The CS11 comes with two vertical divider shelves. 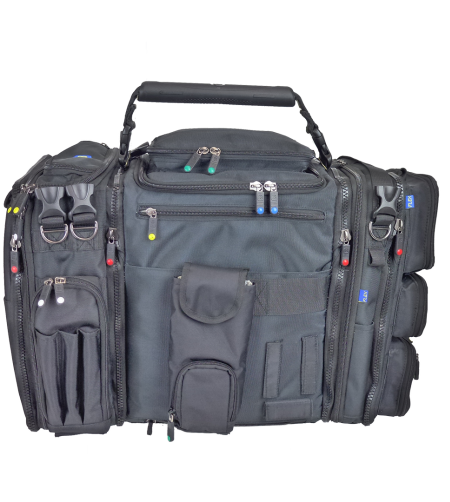 If needed, you can organize a 13″ laptop, documents, and clipboards. The Main Compartment of the CS11 has locking zipper sliders. The top of the CS11 carries a 8 inches square pocket along with double side pocket mounting stations. The CS11 can be installed over the upright handles of our folding cart using the zipper access found on one side. 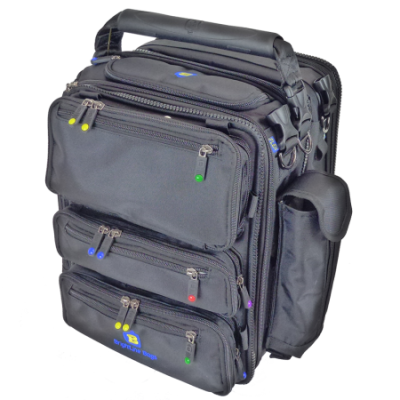 The CENTER SECTION 2 offers two inches of storage and easily carries 13″ laptops, some 14″ laptops, tablets as well as documents, folders, clipboards, etc. The Main Compartment of the CS2 has locking zipper sliders. NOTE: Many of the photos show a small one-inch webbing strap going across the very top of the module. This strap has been removed. It is no longer part of the bag. We removed the strap because it was left over from the pre-FLEX days and it is no longer needed as a secondary handle. We just didn’t want to go through all the trouble of reshooting all the photos just for this minor change. We hope you understand. Keep in mind that the modules included in the B18 can be assembled in any order. You can also remove modules and reassemble the remaining modules into a smaller bag. Or can combine other FLEX System modules. 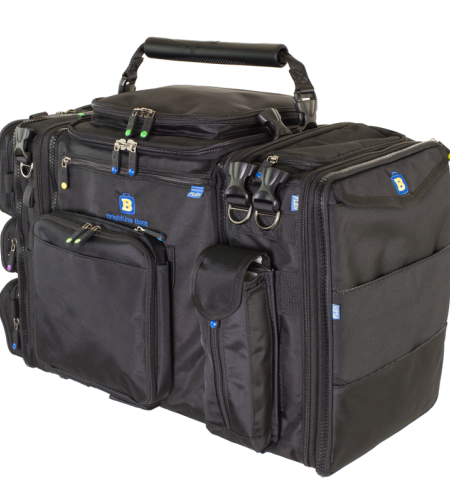 Any FLEX System module can be zipped onto any other FLEX System module. SIDE POCKET ALPHA is often called the “Radio Pocket”. It will hold any, repeat – ANY, handheld radio. And the top flap is such that the antenna can just stick right out the side. In addition, the SPA is great for holding a water bottle. The front face of the pocket has an expansion zipper to allow bottles up to 20 ounces. To carry larger water bottles, please select a Side Pocket Echo instead. 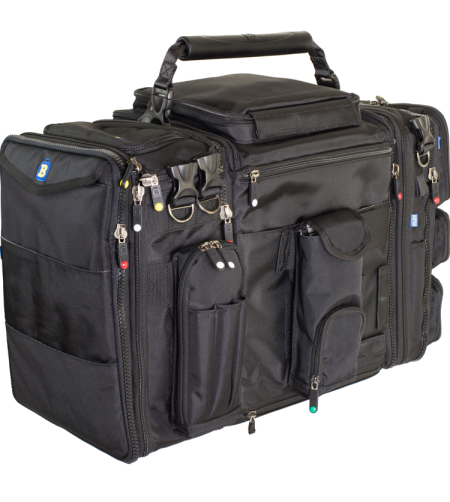 SIDE POCKET BRAVO has two half-height compartments. The upper compartment has a fold-over cover flap and it was originally designed for the short hand-held radios. The lower compartment is closed with a zipper and it is great for holding small items like spare batteries or ear plugs, etc. SIDE POCKET CHARLIE is often called the “Pen Pocket”. I has three pen slots on the outer surface plus a zippered pouch that has room for pens, marker, highlighter, spare reading glasses, etc. Of course, many people will put completely different things in there besides pens. It’s a great pocket many different purposes. 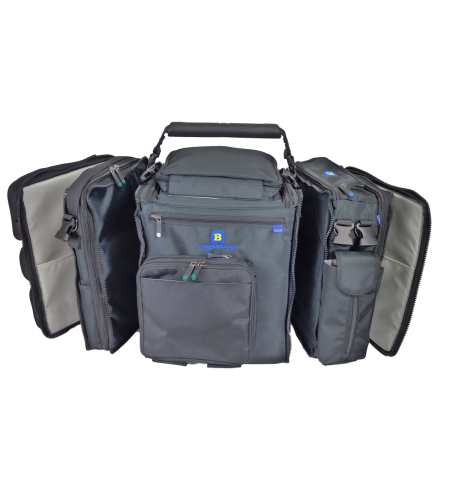 SIDE POCKET DELTA is a “double-wide” pocket which mounts on two adjacent FLEX-mount side pocket stations. The two mounting stations can be found either on a CS11, or they can even be found on two adjacent modules and the Side Pocket Delta can bridge across the gap between the two modules. 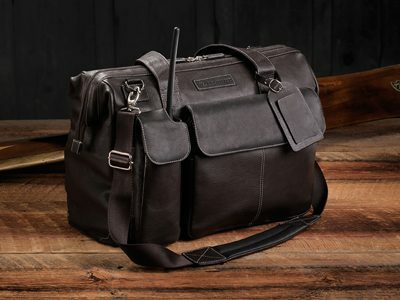 The B18 HANGAR comes with a MAIN HANDLE and a SHOULDER STRAP.